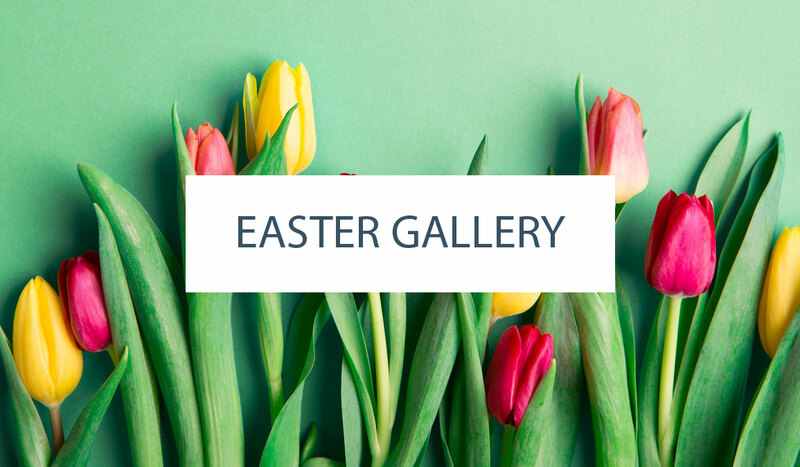 It’s officially May, which means we’re that much closer to summer weather, summer dresses, and summer desserts. One of my favourite summer desserts (but really any season) is Key Lime Pie, which is a rather bold statement for a cake baker. In fact, I will almost always opt for key lime pie over cake if it’s on a dessert menu. Shocking, I know. I honestly scan dessert menus to see if it’s on there and am a little disappointed when it’s not. In light of that, I figured why not make my favourite dessert INTO a cake. And just like that, the Key Lime Pie Cake was born. 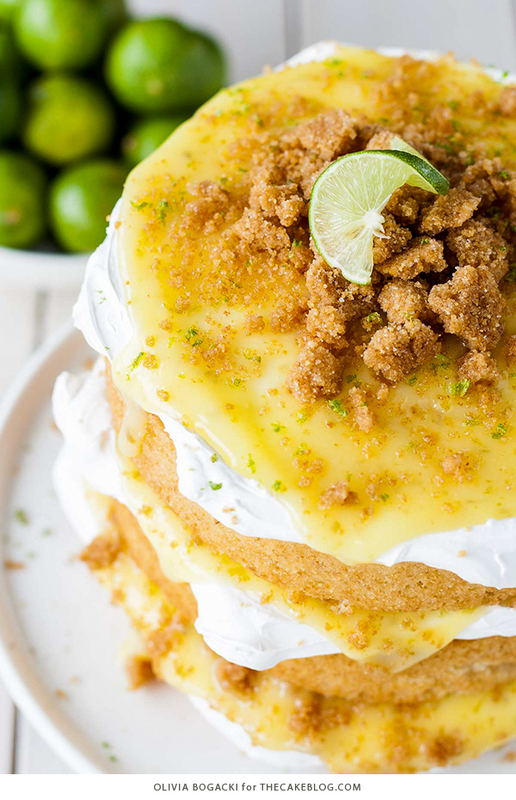 Wanting to do it justice, I incorporated all of the elements of a good key lime pie: sweet and crunchy graham cracker crust, tart key lime filling, and billowy meringue. I added graham cracker crumbs into the cake layers and made a graham cracker crumble for some added crunch. The crumble is totally my favourite part! The texture it adds is amazing. The key lime curd adds a pinch of tartness and pairs perfectly with the light-as-air meringue. This cake is super simple to make, and the rustic style makes it a cinch to decorate, too. To make decorating even easier, I recommend topping each cake layer with meringue individually before stacking. The meringue is thick and sticky, so it’s trickier to spread on the layers once they’re stacked. If you’re looking for a cake to wow your guests this summer or just want a treat to indulge in yourself, this cake is for you! It’s honestly one of the best tasting cakes I have ever made, and I’ll say that only ONE piece of it was given away (somewhat reluctantly, too). 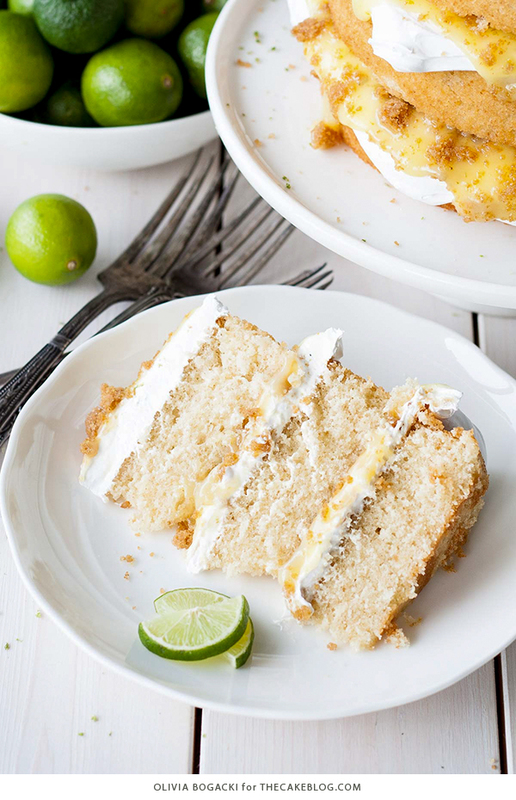 If you love Key Lime Pie as much as I do, I hope you will love this cake! 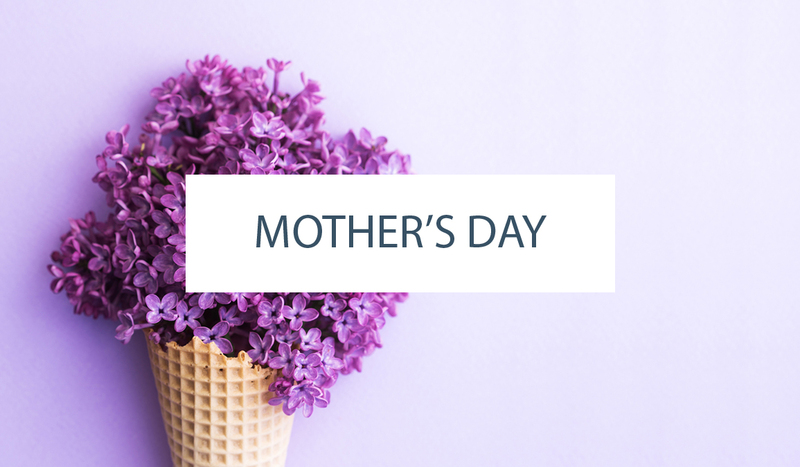 Place eggs and sugar into a small pot, whisk to combine. Add lime juice, zest, and salt, and whisk until well combined. Cook over medium-low heat stirring constantly until mixture thickens and coats the back of a spoon. Reduce heat to low, add butter and stir until smooth. Transfer to a glass bowl and lay plastic wrap directly on surface to prevent a skin from forming. Chill for 3 hours to set. Preheat oven to 300F and line a sheet pan with parchment or a silicone mat. Whisk all dry ingredients. Add wet ingredients and mix until small clumps form. Spread evenly and bake for 15mins. Cool completely before using on cake. Place bowl over a pan of simmering water to create a double-boiler. The bottom of the bowl should not touch the water. Whisking constantly, heat the egg mixture until it registers 160 degrees on a candy thermometer. Carefully transfer the bowl onto the stand mixer. With the whisk attachment, beat the egg white mixture on high speed for 8 to 10 minutes. When done, the outside of the mixer bowl should return to room temperature and the meringue should look fluffy and glossy and hold a stiff peak. Place one layer of the cake onto a cake stand or serving plate. Top with 1 cup of meringue. Spread roughly but evenly. 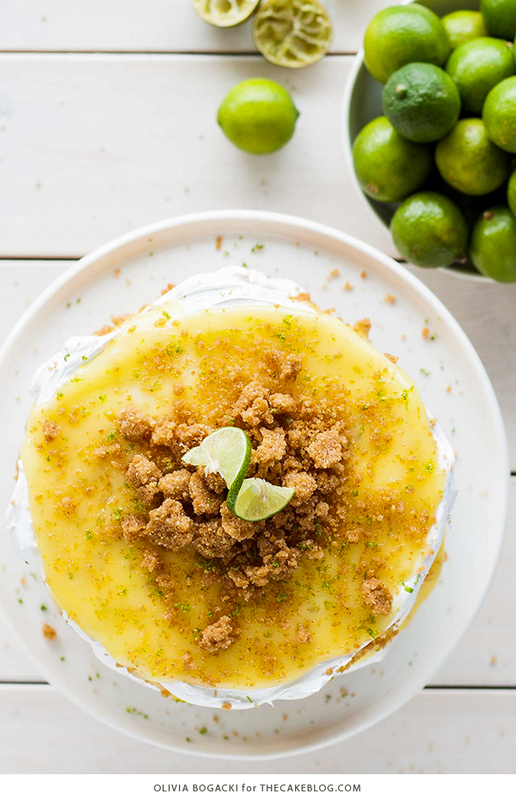 ** Top with approximately 1/4 cup of the key lime curd and sprinkle with crumble as desired. Repeat with remaining layers. ** I recommend topping each cake layer with meringue before stacking. The meringue is thick, so it’s trickier to spread on the layers once they’re stacked. This sounds absolutely delicious! Can’t wait to give it a try! We don’t have key limes here , could I use regular limes?mwould the amount of sugar and lime juice be the same? Hi Susanne! You can swap in regular limes no problem. The amounts would stay the same. What a lovely idea you had! 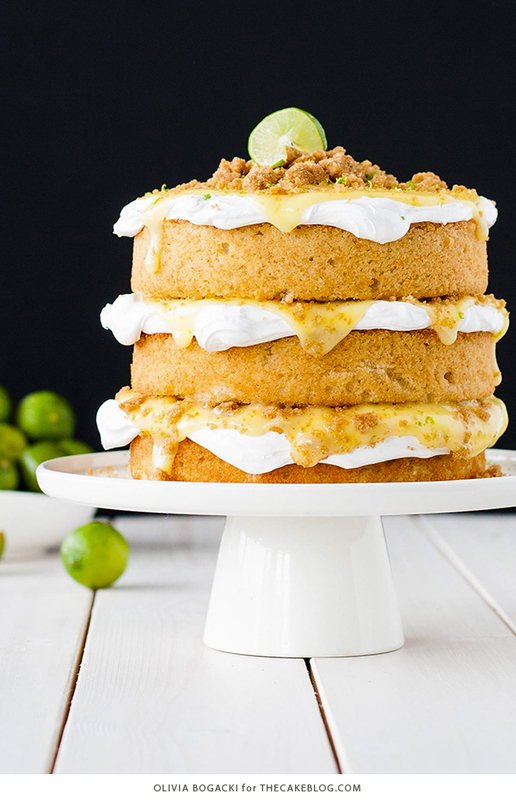 Key lime pies are so fresh and turning it into a cake makes it amazing! 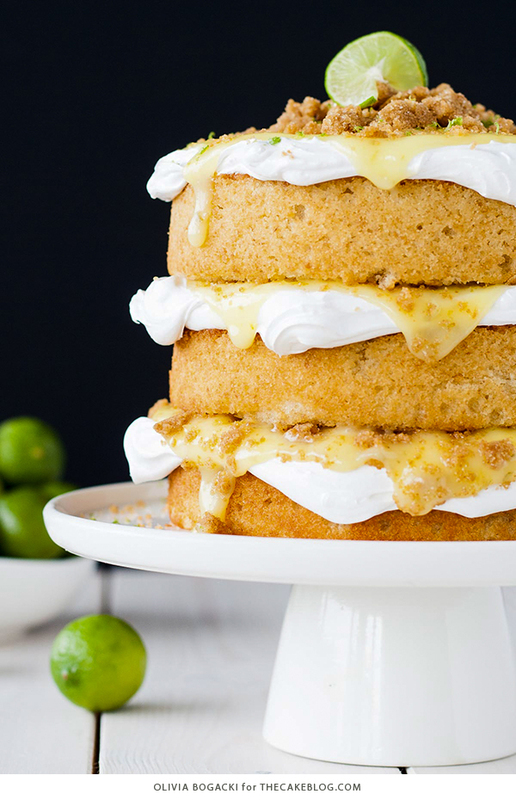 And you shouldn’t feel weird : all cake lovers love key lime pie! The cake looks airy and tasty, it’s so fluffy you could eat it plain! Your key lime curd looks amazing too! Juicy and fresh, just as needed! I must say I’m crazy about the cumble too! I think that, just as you, this might be my favourite part. I love the crunch. Anyways, thank you very much for sharing this lovely recipe, it's definitely a brilliant idea! Thanks Kim! I think the crumble is my favourite part :). It is even BETTER in cake form. I promise :). this looks and sounds delicious! Key lime pie is one of my favourite. Thanks for sharing. Thanks Lucy! I hope you try it :). This cake is all kinds of awesome! That lemon curd dripping off the side.. DROOL!! Thanks Alida! No joke, I was eating the extra curd with a spoon! I, too, love key lime pie and this idea is genius! Thank you! I do have one question, though: my husband is allergic to egg whites so he can’t eat meringue. Could whipping cream or a whipped topping be substituted for the meringue? Sure Heddy, you could substitute whipped cream for the meringue. But we should caution you that there is egg in the cake and lime curd as well. I need to make this ASAP. I love key lime pie too. Thank you for sharing this recipe. I do not own 6 inch cake pans, could I use two 8 inch cake pans? Might not look as impressive as the three layers but would still taste as great. Two 8″ pans would work as well. You’ll just want to keep an eye on your baking time so you don’t over bake. Hi! Thinking of making this for the first time next weekend for a family Father’s Day gathering. Can I make it a day ahead of time? 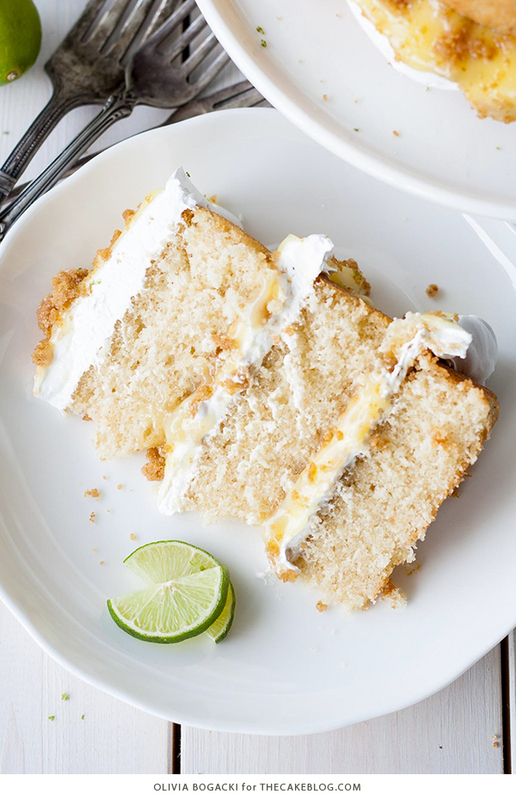 You could definitely bake the cake, make the lime curd and the graham cracker crumbles in advance. Meringue is one of those things that tastes best when made fresh. It also has the tendency to weep in the refrigerator. So if possible, make the meringue and assemble the cake on the day you plan to eat it. Let us know how it goes Alex! I don’t have those round pans, could I make this a 9×13 two layer or what would you recommend? I have to make this tonight for a shower tomorrow. Could you possibly specify whether these are US, Australian or metric cups? I guessed US, but when I converted the measurements I came up with what looked like a really small amount of flour, so it didn’t seem right… Would love to know because this looks really tasty. Pity a poor scientist clinging to the hope of an international system of units…oh wait. Also, having just baked it (ish), what timing/temperature would you recommend for a single-layer version? I’m hoping to use this for a wedding cake… my first trial was a little frustrating… I used my own eggs, added the sugar and then whisked over double boiler to 160 degrees… I whisked that the entire time, then moved to the whisk attached mixer… beat for 15 minutes… glossy and smooth – but wouldn’t hold a stiff peak… or soft peak… no peaking at all ;-]…. I live in a rainy Washington… could that be the problem??? the wedding is in August – so I have time to refine… any suggestions? I used a copper bowl… which is what I use for my angel food cakes.